From their origins in Southwest Asia chickens have spread to all corners of world due in a great part to their usefulness to man. Charles Darwin considered that all chickens as being descendants of a single wild species, the red jungle fowl, Gallus Bankiva, which is found in a wild state from India through Southeast Asia to the Philippines. The chicken is mentioned in ancient Chinese documents which indicate that they were introduced into China in around 1400BC. Chickens are also depicted in Babylonian carvings of around 600BC and mentioned by early Greek writers, notably the playwright Aristophanes in 400BC. Indeed the Romans considered chickens to be sacred to Mars, the God of War. 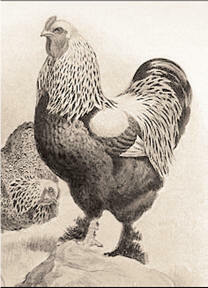 The chicken (Gallus domesticus) was domesticated in southern Asia at least 4,000 years ago from a parental stock of one or more species of jungle fowl (principally G. gallus). Chickens did not arrive in the Western Hemisphere until the arrival of the Spanish. All breeds of chickens in the New World can be accounted for as originating from Old World stock. There is actually a chicken genome mapping project going on in Great Britain which uses data to improve chicken breeding.